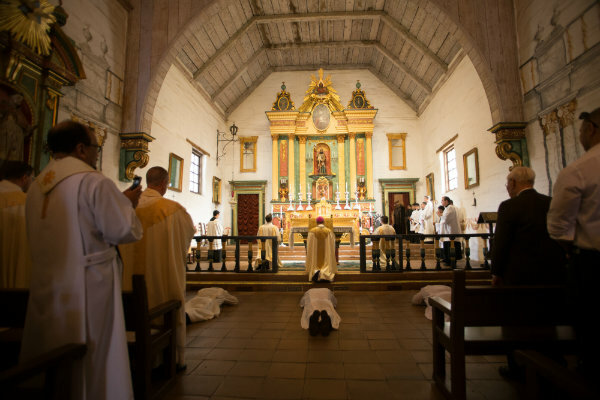 Why Mission San Jose for our deacon ordinations? 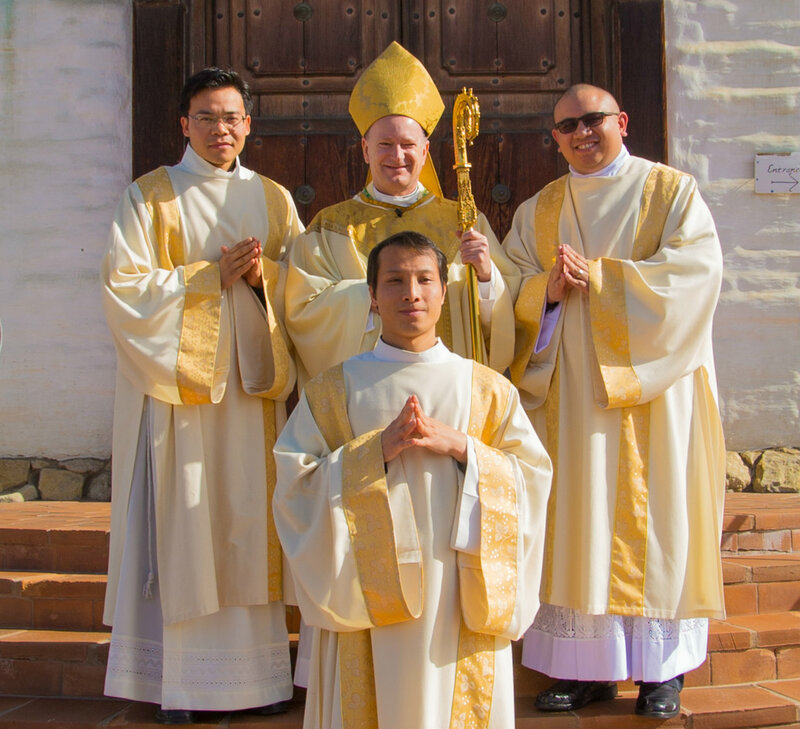 Last Saturday (November 15) I had the pleasure of ordaining three new Transitional Deacons for our diocese: Michael Nufable, Peter Tu Nguyen, and Huong Van Le. We held the ordination in the Mother Church of our Diocese: Old Mission San Jose in Fremont. I say “Mother Church” because Mission San Jose was our first parish, started in 1797, where the first baptisms took place. Although the current Mission church is a reconstruction, it is based on the original plans. Many of the religious artifacts are from the original church. I chose the Mission because I wanted the young men to have their deaconate in our oldest church, and their priesthood will be in our newest: the Cathedral of Christ the Light. I also wanted the very building to remind the newly ordained of what Jeremiah said in the first reading of the deaconate Mass: “Don’t say you are too young!” The founding Franciscan pastor, Fr. Isidore, was only 31. His parochial vicar, Fr. Augustine, was only 23. Look what they accomplished! 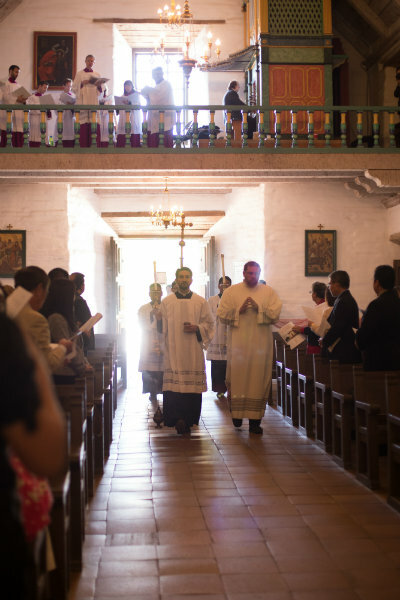 Having the ordination at Mission San Jose also highlights the fact that Spanish was the official language of California before English – and that the Ohlone Indian language preceded both. The new priests had to first learn the Native Americans’ language before they could even begin to build their parish. Same is true today in our Diocese. New priests and seminarians come to us from abroad and need to master English — and increasingly Spanish — in order to minister to our people. Thanks to Darwin Sayo/The Catholic Voice for these photos. 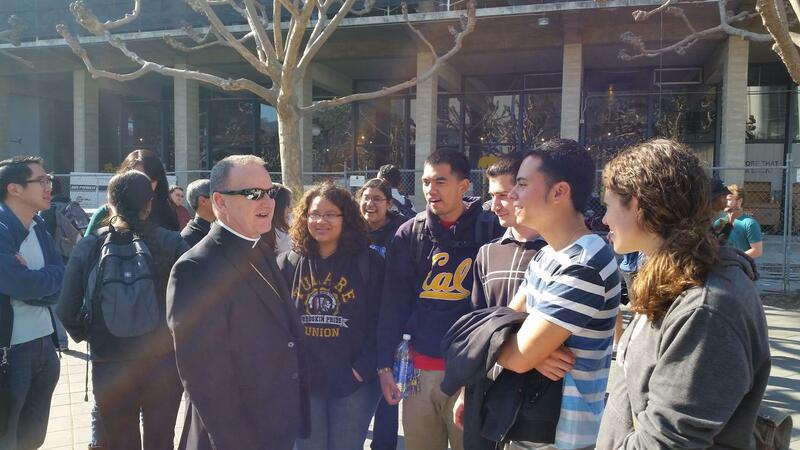 On Tuesday we welcomed 1,200 Eighth Grade students from our Catholic schools to the Cathedral. This is one of my favorite annual events. 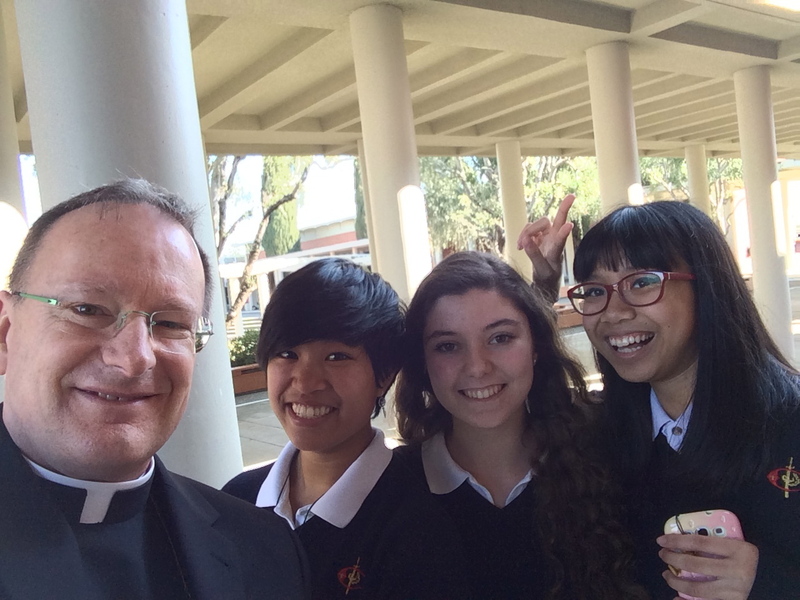 It allows the students to enjoy a solemn Mass at the Cathedral – with commentary by yours truly. I remember Monsignor Ronald Knox’s book “The Mass in Slow Motion” which were commentaries he gave school girls during Masses he celebrated for them. 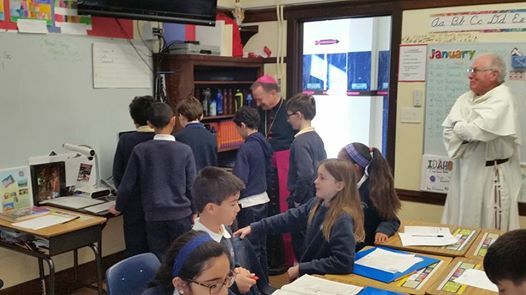 I was very impressed by how well behaved and interested our students were in the holy rites. 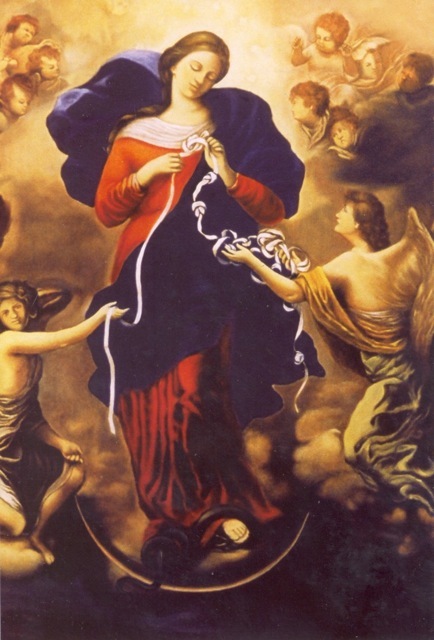 Art, music, beauty and sacred mystery draw us to the Lord. 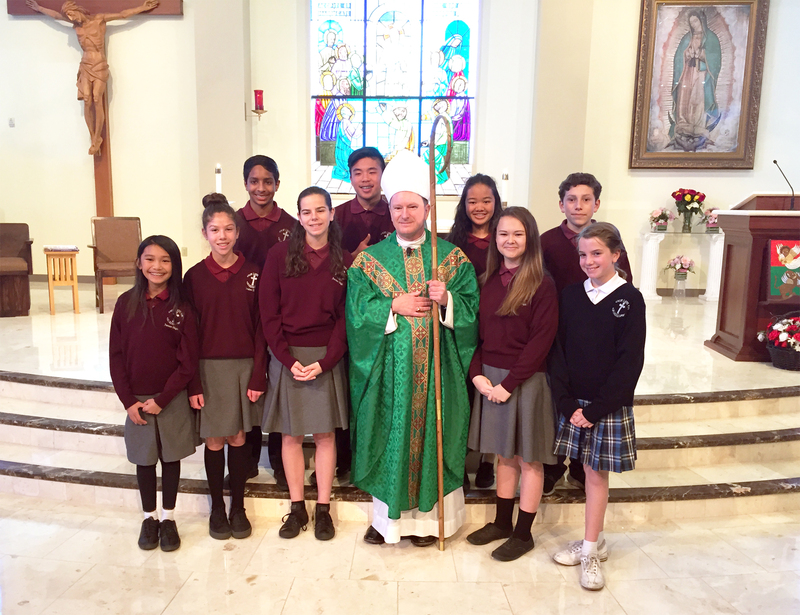 I explained to the kids the meaning of each of my vestments – gave an illustrated homily — and presented each student a blessed medal of St. Michael (I know . . . my vanity!). 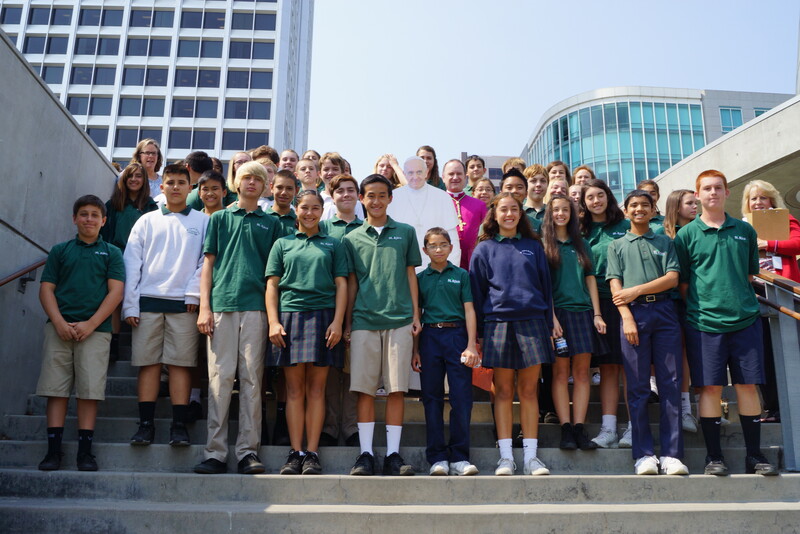 We posed for “photos with Pope Francis” afterward. 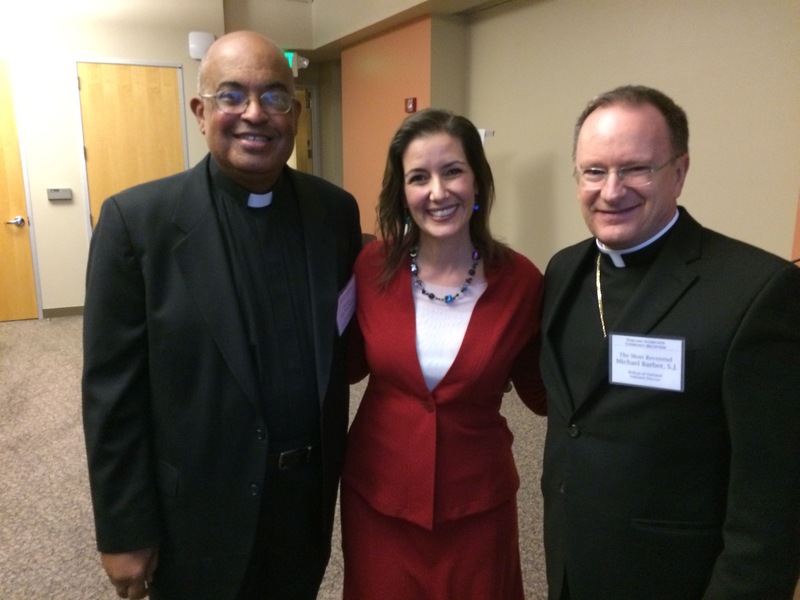 It’s times like these that I am so grateful for our Catholic Schools – and our dedicated teachers and staff. 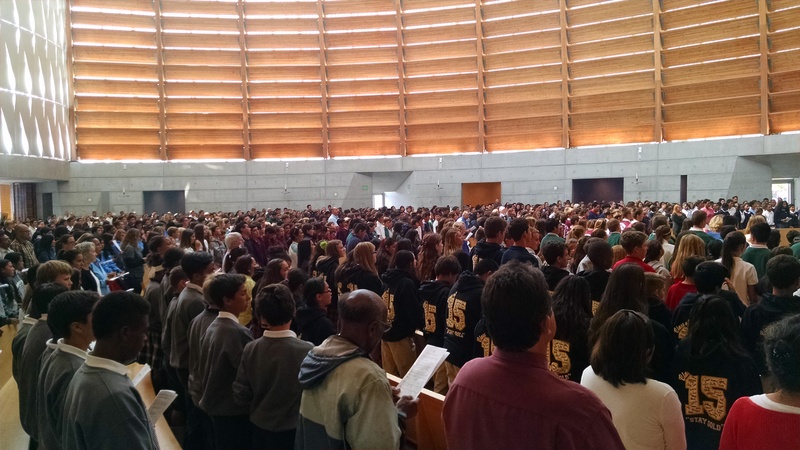 I love seeing the cathedral filled to overflowing – especially for the sanctification of our young people. Thank you to all who donated to this beautiful Temple of the Living God.